In Indian culture, an elephant signifies, wisdom, abundance and Strength. Hindu God Ganesha, is a representation of all these three attributes being elephant headed. Elephants have established their mammoth presence in the cultural and religious planes of Indian civilisation from time immemorial. Since ancient times, elephants in India were mostly used as war elephants and also as work elephants. India was a pioneer in using elephants in wars as these large animals can instil terror. The Mayuran rulers are believed to have used as many as 9000 elephants in their army. Elephants can move large and heavy objects; which makes them useful in timber and construction industry. The custom of using elephants for temple processions began only a few centuries back. In some parts of India, owning an elephant is considered as a status symbol. Elephants are generally classified as African Bush elephants, African forest elephants and Asian elephants. African elephants have much larger ears, larger in size and have concave backs compared to Asian elephants and they are also differentiated by their head shape, and their tusks. Both male and female African elephants grow tusks, but only male Asian elephants can grow them. An Asian cow elephant weighs 2.5 – 3.5 tonnes and a bull weighs 3.5 to 5 tonnes. Elephants generally have poor eyesight and they rely mostly on sense of smell. It is said that they can recognise people by their smell, even after several years. Unlike human beings, elephants have very few sweat glands so they fan their ears to maintain body temperatures. An elephant that fans its ears constantly is considered healthy. They also spray water on their body to keep cool. An elephant’s trunk is formed by the fusion of the upper lip and the nose. It is made of approximately 1,00,000 muscles. The biggest enemy of an elephant is its own tusk. Elephants are poached for its tusk which fuels the illegal ivory trade around the world. Indian elephant is a subspecies of Asian elephant. The other two subspecies of Asian elephants are Sri Lankan and the Sumatran. Indian elephants are lighter in colour compared to Sri Lankan elephants but darker than Sumatran elephants. Apart from India, Indian elephant is found in Nepal, Bangladesh, Bhutan, Myanmar, Thailand, Malay Peninsula, Laos, China, Cambodia, and Vietnam. The geographical classification of Elephants subdivides the Asian species to another two subdivisions namely, Burmese and Malaysian elephants. Indian elephants are spread across India and found in the north eastern states of Assam, Meghalaya, Nagaland, and Arunachal Pradesh. – Odisha, Jharkhand and West Bengal in Central India and in the South, in Kerala, Karnataka and Tamil Nadu. The 2017 synchronised all-India Elephant Population Estimation pegs India’s Asian elephant population at 27,312. Asian elephants typically give birth to a calf in four to five years in the wild. Assam has the second highest population of Elephants in India. Nearly a hundred elephants are killed in Assam every year as a result of human – elephant conflict. As tea plantations encroach into forests, elephants lose their natural habitat. Elephant deaths are attributed to many reasons like poaching, poisoning, electrocution and hit by speeding trains. Assam is also famous for the Kaziranga Elephant festival. The festival organised by the Forest Department and Tourism Department of Assam is a big tourism draw card for the state. 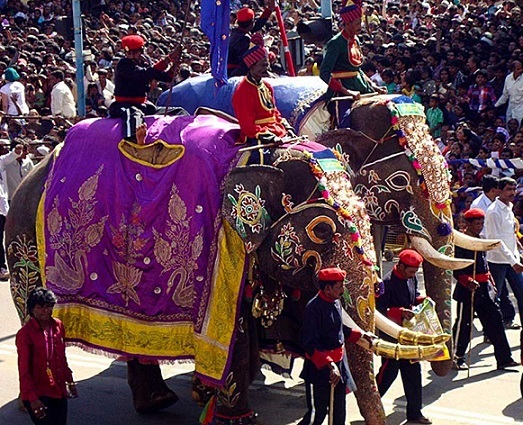 The three-day festival usually features elephant shows and processions of elephants with full decorations. 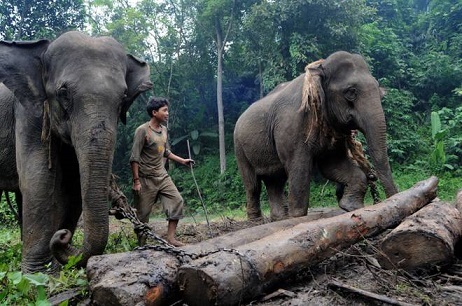 As elephant habitats are encroached by humans, Nagaland faces the worst case of human – elephant conflict. These conflicts result in loss of life on both sides and at times elephants have to face the extremes of human cruelty. Recently when Himachal Pradesh sought the help of Nagaland for solving their monkey menace by re- settling around 30,000 monkeys in Nagaland, in return Nagaland asked them to take some of their elephants. 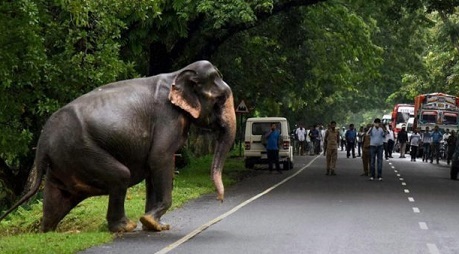 Human – elephant conflict is not isolated to the North East but an issue in every state in India where there is a considerable elephant population. Elephants loves to play in water and can swim long distances. Elephants require enormous amounts of food. So they have to travel constantly in lookout for food resources and for that reason they do not stay confined to one place. This is one issue associated with elephant reserves as elephants move on to other areas for food and most of the time they end up at cultivated areas. Moreover, elephants require nearly 250 litres of water every day for drinking. In some tribal areas in the North East, the locals have acquired a taste for elephant meat. 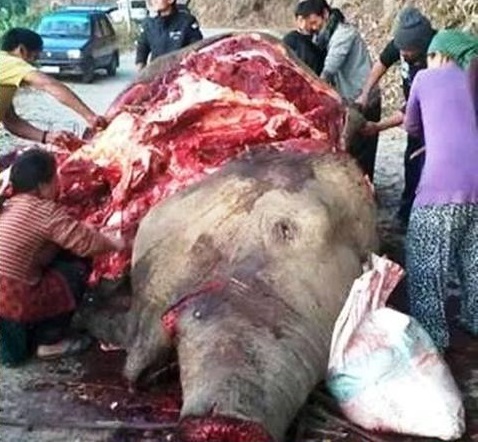 There were unconfirmed reports that in the Karvi Aglong Hill region in the North east, elephant meat is sold in local markets in various names and people have acquired a taste for it. The situation in Arunachal Pradesh is not any different to these large mammals than anywhere in rest of India. The Kameng-Sonitpur Elephant Reserve, which was established in 2002 in the eastern hill forests of Arunachal Pradesh is home to around 1200 elephants. In Meghalaya, elephant population is on continuous decline over the years due to habitat reduction. The elephant population recorded in Meghalaya in 1998 was 1840, while in 2002 it increased to 1868 and in 2008 the population of the elephant was reduced to 1811. Due to increased poaching, electrocution and various other reasons, it is sensible to believe that current population of elephants are much below the 2008 census. No elephant census was taken after 2008 in Meghalaya. Another issue Meghalaya faces is the migration of elephants to Bangladesh in search of water and food. In some cases, the elephants are not able to come back, as they usually do, as new human habitations have come in and around the routes earlier taken by the elephants in the Bangladesh border. Then the only available option is to give protection for elephants in Bangladesh. The dialogue between the Meghalaya Government and Bangladesh Government on trans-boundary conservation of elephants are still in its infancy. Project Elephant was launched by the Government of India in 1992 to establish elephant reserves in areas where there is a sizable population of these animals. Currently there are 32 elephant reserves in India. As a part of the project a new elephant reserve was established at the Garo Hills. There is one in Khasi Hill too. Odisha, West Bengal, Jharkhand and Chhattisgarh had an elephant census on 2017 which was carried out simultaneously. In Odisha the population has increased to 1,976 from 1954 in 2015. Odisha has Three Elephant Reserves at Mayurbhanj, Mahanadi and Sambalpur. One major cause of elephant deaths in Odisha was identified as electrocution. The Odisha Government has taken measures to increase the height of electricity supply poles and to build metal fences around poles to reduce electrocution at the elephant corridors in the state. Situation in West Bengal is no better than the rest, though the Elephant population in the state has increased. Human elephant conflict happens due to many reasons. Apart from electrocution, and poisoning, conflict due to trans-border movement of elephants from Bengal to Nepal, being hit by trains, and the existence of Tea cultivation at the elephant corridors increased the barriers in sustaining the existing population. A photograph titled ‘Hell is Here’ by Biplap Hazra was shot in West Bengal’s Bankura district won the wildlife photography award for 2017 instituted by the Sanctuary Asia wildlife magazine. 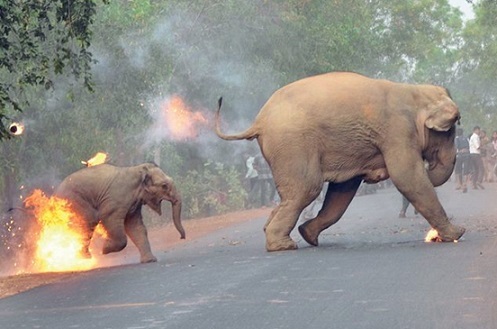 The photograph of the burning elephant calf and its mother fleeing a mob, caught the world attention for inhuman treatment of these pachyderms. Like the rest of India many humans die of elephant depredation in WB. Forest officials in West Bengal’s Bankura district now started sending SMS alerts about elephant movement to prevent such unfortunate incidents happening. 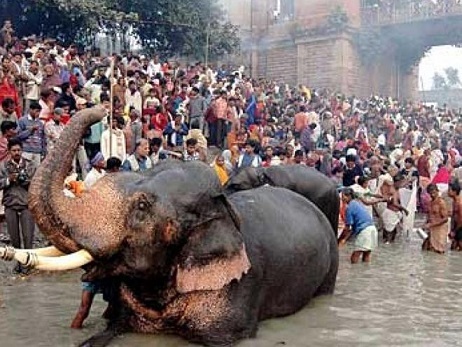 Sonepur Mela, arguably Asia’s largest cattle fair in Bihar which takes place during the month of November, used to have a ‘hathi bazar’ (elephant market), where elephants were sold. Sale and purchase of elephants are banned under the animal protection laws in India. But even after the ban elephants were sold at the Mela. After many restrictions were imposed by the Government, nowadays only a few elephants are brought here for sale. At its peak, around 800 to 1000 elephants were on display for sale here. As per legend of ‘Gajendhra Moksha’ in Hindu mythology, Lord Vishnu rescued an elephant king from a crocodile at the confluence of the Ganga and the Gandak at Sonepur. Jharkhand recorded a steep decline in elephant numbers as per data revealed in the 2017 census. The population reduced from 688 in 2012 to 555 in 2017. In 2017, elephant depredation resulted in 62 deaths in Jharkhand. According to a Greenpeace report, though Chattisgarh, Jharkhand and Odisha account for only 10% of the elephant population in India, 65% of human causality happen in these regions. In the worst effected Surguja division in Chhattisgarh forest department wanted to use Kumki elephants from Karnataka to tame and capture wild elephants that stray in human settlements. Kumki elephants are trained elephants used for capturing and training wild elephants. Though South India accounts for 55% of Elephant population in India, the human- elephant conflict is much less compared to the rest of India. As per 2017 census, Karnataka has the largest population of elephants in the country with a count of 6,049 followed by Assam’s 5,719 and Kerala’s 3,054. Elephants are the most important part of Dasara Processions in Mysore in the month of October. The lead elephant carries the Golden Howdah (Chinnada Ambari) with the Goddess Chamundeshwari in it. 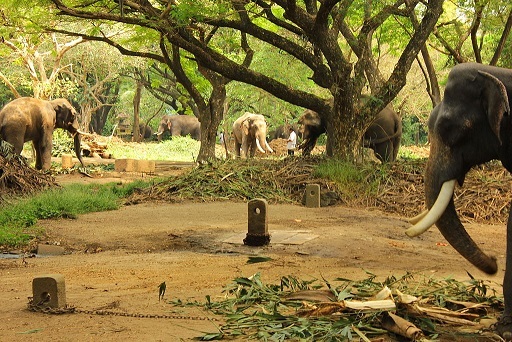 Temples in South India have a tradition of keeping elephants. At least 40 of the Hindu religious establishments have their own elephants in Karnataka. Temples prefer to have cow elephants, as with bull elephants they have to deal with the occurrence of musth. Temple Elephants as a matter of fact are made to stand continuously for long hours on concrete surfaces. They are also made to walk on tarred roads in hot weather heavily chained, bruised by shackles around their legs. This makes them prone to foot problems like foot rot. More over temple elephants are over fed with unnatural food — including Jaggery, rice, payasam, etc. Lack of exercise and companionship, isolation from herd etc have a detrimental effect to their wellbeing which leads to aggressiveness and other behavioural issues. The State of Kerala has the highest number of Temple elephants. Kaundinya Sanctuary in Chittoor district of Andhra Pradesh established in 1990 is the only sanctuary in Andhra Pradesh to house the Asian Elephants. Tamil Nadu has five elephant sanctuaries – Nilgiri Elephant Reserve, Coimbatore Elephant Reserve, Anamalai Elephant Reserve and Srivilliputtur Elephant Reserve. In 2017 Elephant census, both Kerala and TamilNadu registered huge drop in Elephant population. In 2012 Kerala had 5942 elephants but 2017 census recorded a reduction of 2888 to 3054 elephants. In TamilNadu, 2017 census recorded a population of 4015 and in 2017 it reduced to 2716. 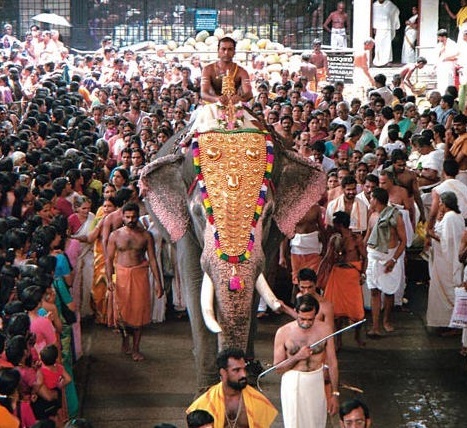 Trissur Pooram: A temple festival celebrated with a grand display of caparisoned elephants, dazzling parasols, and percussion music in the Malayalam month of medam ( gregarian Calendar April – May), held at the Thekkinkadu Maidanam in Thrissur. 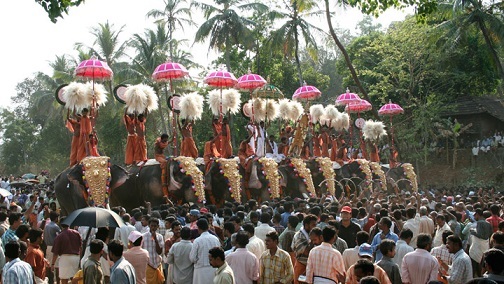 Nearly a hundred elephants are paraded for Trissur pooram. Arattupuzha Pooram: The annual festival at Arattupuzha is also termed as the mother of all pooram festivals in Kerala, due to its sheer magnitude and grandeur. Peruvanam Pooram: It is held at Peruvanam Temple in Cherpu, Thrissur District. The pooram occupies an important place in the cultural fabric and history of the state of Kerala and the procession of elephants accompanied by the temple music is a major attraction. Chinakkathoor Pooram: Sree Chinakkathoor Bhagavathy Temple hosts one of the most unique and colourful poorams in Kerala. Situated in Palappuram near Ottapalam Taluk, this festival with the procession of 33 elephants draws in people in large numbers annually. Pariyanampetta Pooram: Seven days of cultural and spiritual revelry is what draws people to the great Pariyanampetta Pooram, the annual festival at the Pariyanampetta Bhagavathy Temple. The event ends when a procession of around 21 elephants is taken out and people can see folk arts like Kaalavela (bull effigy) and Kuthiravela (horse effigy). Uthralikkavu Pooram: Uthralikkavu Pooram is celebrated in Sree Ruthira Mahakalikavu Temple in Vadakkancherry. It is among the most anticipated festivals in Central Kerala. The festival is held every year in the Malayalam month of Kumbham (usually falls on February / March). The elephant pageantry is the main attraction. Caparisoned elephants are the centrepiece of the celebration. Guruvayur temple has the largest number of elephants in Kerala. 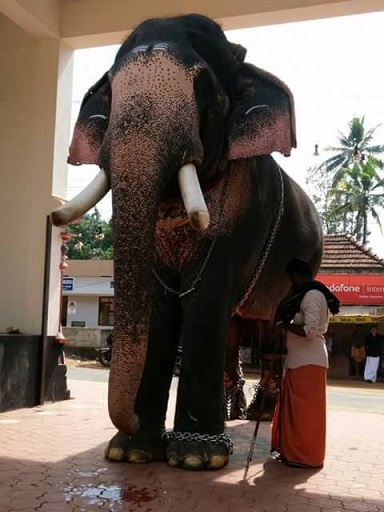 The temple takes care of 59 elephants at Punnathurkotta, 2km away from the temple. The temple spends around Rs 2.5 crores every year for the upkeep of the elephants. The elephants also bring in a revenue of Rs 1 Crore every year. Most of these elephants are donated by devotees to temple for wishes fulfilled. Though elephants are poached for their tusks, electrocuted and poisoned, thrown petrol bombs at, Elephants – The innocent victims of human activity is blamed for the death of humans that happens as a result of human-elephant conflict. Still an elephant walks tall capturing the imagination of human beings inspiring our folklores with stories of its strength, wisdom and majestic appearance.